Teeny Tiny Collage Patterns Group #3. 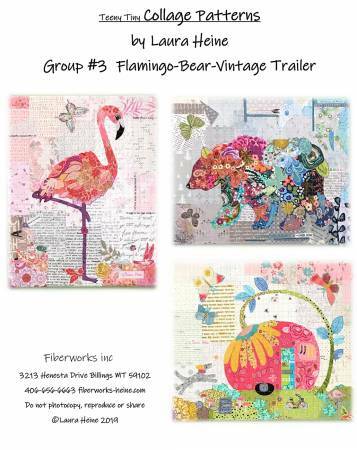 Three different patterns Bear, Flamingo and Vintage Trailer each finish at 16 x 20 all included in one pattern! These quilts can be finished as tiny wall hangings, pillows, or stretched on a canvas and hung. Each different pattern in the collection requires 3 yards of 12” Steam a Seam 2, 19 x 23 piece of Pattern Ease Foundation and an Applique Pressing sheet (as they are constructed on it).